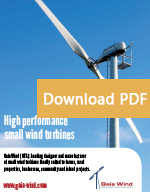 Gaia-Wind is a world leading manufacturer of high performance small wind turbines. Our turbines have went unseen and unheard for over 20 years. Here is why…Gaia-Wind 133 small wind turbines have a long track record of reliability. Designed and manufactured in Scotland to operate in moderate wind speed areas, the G-W 133 can now be found in over 2000 sites worldwide. Our customers have found that installing one or more Gaia-Wind turbines an easier and more convenient way of generating ROI than medium wind turbines. 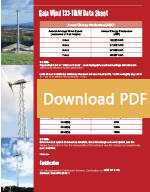 Our wind turbines are ideally suited for working farms, businesses, rural properties, island and community projects. Generating Island-Sustaining Energy – The remote location of the island presents some challenges, particularly in the form of high energy costs. Electricity rates there are frustratingly high at $.50 cents per kWh, and residents are also dependent upon expensive, imported fuel transported from the mainland by oil tanker. Getting Energy from the Ecosystem – Lovango Cay residents are intimately aware that islands act as their own living, breathing ecosystems, so what better way to preserve that than using its own valuable natural resources to power it? With the help of Talco, the islanders created a zeroemission, self-sustaining source of energy that not only reduces costs, but also frees the island from dependence on oil tanker deliveries for energy. So far, the Gaia-Wind 11 kW turbine has produced as much as 191 kW in a single day, which has pleased both the Talco team and island residents. The turbine will generate approximately 50% of energy consumption on the island. We can provide emergency wind power units.